Keyword match types help Bing Ads determine how closely a search query or other input must match your keyword. Generally, the more precise your match type, the higher your click-through and conversion rates and the lower your impression volume tends to be. Finding the right balance between conversions and impressions can help maximize the ROI of your campaign. Describe the different keyword match types. Choose the appropriate match type or match types for your keywords. Bid on the appropriate match type for your campaign. Broad match triggers the display of your ad when a user searches either the individual words in your keyword in any order, or words related to your keyword. Use broad match keyword matching when you want to sell a broad set of products to a large group of customers. With broad match, you can give your keywords more focus without using phrase or exact matches. Ensure your campaigns are opted in to broad match to get maximum reach without sacrificing quality with other match types. Dial broad match up or down depending on conversion values by bidding explicitly for each match type relative to performance. To further enhance control, use negative keywords to block unwanted query matches. Advertisers can use exact or phrase negatives. Leverage targeting (including in-market or remarketing), bid modifiers, and auto-bidding to help optimize for CPA, CTR, or volume. Remember to leverage the Opportunities page and Bing Ads Intelligence tool for more customized broad match keyword suggestions. As a last resort, use broad match modifiers to set restrictive limits, keeping in mind that broad match modifiers can block up to 90% of broad match potential volume. If you’re bidding on the keyword Hawaii hotels, your ad might also display to people whose query did not include Hawaii hotels. But what if you want more control over which ads your query display for when using the broad match type? For example, as a hotel owner, if you feel that queries containing vacation rentals are unlikely to result in clicks or conversions, you would probably want to suppress your ad for the searches containing the term. At the same time, you may not want to limit your ads too much, by using more restrictive match types. The solution is a variation on the broad match type – something called a broad match modifier. A broad match modifier tells Bing Ads that a specific word or words, or their close variants, must be present in order for your ad to display. Note: It is recommended to use a combination of broad match and broad match modifiers. Bing Ads does its best to make sure the related queries are highly relevant to your keywords. To get back to our example, if you want to require that the word hotels is included in search queries, you would create a new broad match modifier with a + sign proceeding hotels. The + sign indicates that hotels must be included in the search query in order for your ads to be eligible to display. When used in combination with negative keywords enhancements, the broad match modifier allows you to create keywords that have more reach than exact or phrase match, yet more control over your broad match traffic. The result is higher quality clicks and more traffic to your website. Phrase match triggers your ad when all of the words in your keyword match words in a user’s search query. The words can be present in the search query in exactly the same order or re-ordered if the intent of the search query matches that of your keyword. If your phrase match keyword is "winter vacations", you could match to the search queries ski winter vacations and ski vacations winter. Use phrase match keyword matching when you want to see a particular type of product to a targeted group of customers. Phrase match can increase the relevance of the matching queries as compared with broad match. Exact match triggers your ad when the exact words in your keyword appear in a customer's search query. Exact match can also match to search queries that are minor variations of the keyword. These are considered close variations. Close variant search queries can include singular, plural, abbreviations, misspellings, punctuations, accents, stemming, reordered words, synonyms and implied words. Choose the exact match keyword match type when you want to pair your ads and landing pages to a very targeted set of customers. Negative keywords can be phrase or exact matches you use when you know a term doesn't apply to your business. Negative keywords can be specified at either the campaign or ad-group level. On the Campaigns page, under Shared Library, you can also create lists of negative keywords and associate them with as many campaigns as you like. You can easily edit these lists to add or remove keywords in bulk, and link or unlink them from campaigns. You can have up to 20 lists per account with a maximum of 5,000 negative keywords per list. Use shared negative lists for terms you will never use on any ad. Ex: Create a “global” list and associate the list to all campaigns. Run the search term report to further fine-tune negatives for unwanted matches. Use negative phrase keywords sparingly — they prevent your ad from delivering any query that contains the phrase, and it is easy to inadvertently block traffic you might want. Impressions blocked by negative keywords do not count as part of your “voice” in the share of voice report. Run the negative keyword conflict report to identify cases where you may have negatives that are blocking core traffic that might be useful to you. For exact match and phrase match keywords, your ad may also show on queries that match minor variations of the keyword, so you can maximize relevant matches without having to add all of these variations yourself. Close variations are also considered for broad match modifier keywords. Close variation matching takes place in the United States, United Kingdom, Australia, Canada, France, Germany, India, Italy, Netherlands, Spain, Sweden, and Switzerland. Plurals: The keyword luxury +resorts will match the query luxury resort. Stemming: The keyword +swim team will match the query swimming team. Misspellings: The keyword Hawaii +vacation will match the query Hawaii vacaton. Abbreviations and acronyms: The keyword Redmond +Washington will match the query Redmond WA. Word blending and splitting: The keyword +super +market will match the query supermarket. Common spelling variations: The keyword community theatre will match the query community theater. Punctuation: The keyword real estate will match the query real-estate. Accents: The keyword +café will match the query cafe. Accents are not considered for close variations for English ads in the United States and Canada. Reordering: The keyword chicken teriyaki will match teriyaki chicken. Reordering occurs only if it doesn't change the meaning of the query. Stop/function words: The keyword tv schedule tonight will match tv schedule for tonight. Stop/function words (for example: is, a, the, on, for, in) may be ignored if they don’t impact the intent behind a query. Synonyms and paraphrases: The keyword glucose levels normal range will match normal range for blood sugar. Implied words and same search intent: The keyword Contoso airlines will match Contoso flights airlines. Which match type is used? If you bid on multiple keywords with similar text but different match types, the narrowest match type will take precedence when your ad is displayed. For example, if you bid on both the exact match keyword [red flower] and the broad match keyword flower, a search on red flower will trigger the exact match and not the broad match. 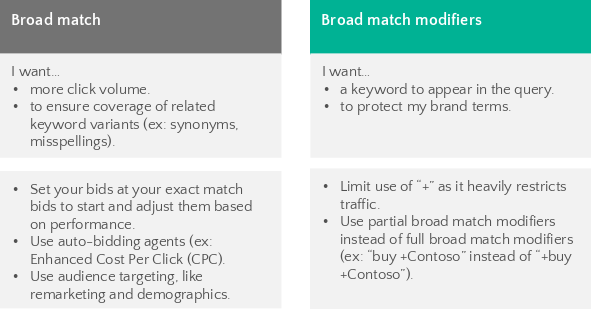 The order of keyword match types, from broadest to narrowest: Broad match, Broad match modifier, Phrase match, Exact match. This lets you track your keywords' success in Bing Ads more easily and lets you customize the bid for each match type independently. You can refine your bidding strategy as you gain data about what is successful for your searches. If you choose not to place separate bids on each match type, you can simply bid on the broad match type for your keyword, and the system will treat it as a bid on broad, phrase, and exact match types, all at the same amount. Or you could bid on phrase match only, and the system will treat it as a bid on phrase match and exact match, but searchers will not see your ads if they represent a broad match to their queries. One strategy to test with match types is by customizing your landing pages to provide a more relevant experience for potential customers. You can measure and track performance by keyword match type to more effectively optimize campaigns. You can pause or resume ads by keyword match type. If you do not specify bids for all match types, bids are inherited from less restrictive match types. Thus, while bidding on broad match is convenient and easy to manage, bidding on each match type independently gives you greater control and allows performance data to be broken out by match type. In the absence of a bid, the next less restrictive bid is inherited by the match type without a bid. This means exact match inherits the phrase match bid, and the phrase match inherits the broad match bid. If neither exact match nor phrase match bids are specified, then both match types inherit the broad match bid. This is never reversed; exact match bids are never applied to a phrase match, and phrase match bids are never applied to a broad match. Use negative keyword when you know a term doesn't apply to your business. Use website exclusions prevent your ads from appearing on websites that do not further your advertising goals. Consider close keyword variations to maximize relevant matches. Bidding on each match type independently gives your greater control than bidding on broad match. Thanks for reading this training on keyword match options. Continue your training or take the Bing Ads Accredited Professional exam to become accredited. Please note all features in this training may not be available in your market.